Hi, I'm back again! This card started out in gold and after 3 messed up images I decided to change color. Lol! And, I was too lazy to color it. 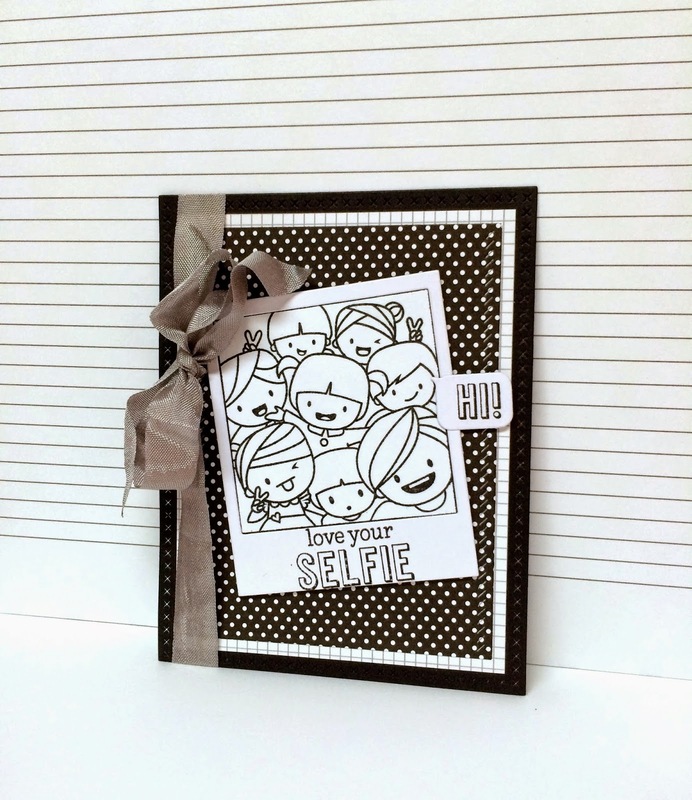 I love this selfie stamp set from Mama Elephant. I think it would be cute to stamp it for a child to color too. I also used the matching dies to cut the polaroid frame out. Paper used is all Doodlebug Designs from an older release. I used Versafine ink from Imagine Crafts. Don't forget that we are having a free Sizzix make & take at the store this Saturday, April 25th from 11:30-1:30 pm. Hope you're having a great week and thanks for stopping by!!! Birthday card from all of us! Hi and happy Tuesday!!! I haven't made anything crafty in awhile and so it seemed like days before I actually came up with a birthday card for my husband. He will be celebrating his birthday tomorrow, tax day! I can't help myself with these Mama Elephant stamps and dies. I would like to have all of them. I used the Just Hatched stamp set for the images. I finally got the Selfie stamp set and matching dies too. I hope this card isn't too cute for him. I have such a hard time making masculine cards. Can't wait to ink up some new stamps. So many things going on this month. Can't wait to see my Sizzix girl in a week. I'm enjoying my new job but it sure is a lot of work! If you get a chance, stop by the store next week Saturday the 25th. We're going to be doing a make & take from 11:30 - 1:30 pm and you'll get to meet one of the Sizzix designers Deena Ziegler. Labels: Birthday card from all of us!